As the last full day of the 2012 presidential campaign gets under way, the Signal's prediction remains the same as it was nearly nine months ago: President Barack Obama will win reelection with 303 electoral votes, winning Ohio and Virginia but losing Florida to Gov. Mitt Romney. There is only about a 15 percent chance that we'll actually be correct, based on our prediction model, given the many combinations of close states that could go either way. Obama has a 24.8 percent likelihood of winning Florida, while Romney has a 40.8 percent chance of snagging Virginia and a 19.9 percent chance of securing Ohio. Romney needs to sweep all three states to secure the election. This may make it seem like all hope is lost for Romney — the odds of him defending Florida and taking Ohio and Virginia are about 6 percent if you simply multiply the probabilities. While the Signal is predicting an Obama victory, we're not calling it with 94 percent certainty. That is because state elections are not entirely independent events. The polls could be systematically biased toward Obama based on faulty assumptions about voter turnout, or the final polls could fail to capture a late surge in support for the Republican candidate. In Florida, Romney leads Obama with 50.65 percent of the vote, not counting third-party candidates. The two main poll aggregation sites, Pollster and RealClearPolitics, disagree over the inclusion of several recent polls, but both point to a slight lead for Romney. The two main prediction market sites, Betfair and Intrade, also disagree over the level of the lead, but they both point to a likely win for Romney. Long lines have marred early voting in the Florida. Republicans are expected to benefit from the reduction of early voting from 14 to eight days, especially the elimination of voting on the Sunday prior to the election, where African-American churches historically voted en mass after church. Even so, 4.3 million votes were cast early, and the state is on track to just about match 2008 voting figures. In Virginia, Obama leads Romney with 50.50 percent of the poll-share going to either of the two candidates. This is essentially the opposite situation to Florida, but with one key distinction: There is much less variance in the Virginia polls. Where the Florida polls swing wildly, the Virginia polls provide a small but consistent lead for Obama. Prediction markets are in full agreement with Obama's small lead in Virginia. In Ohio Obama leads Romney with 51.65 percent of the poll-share going to either of the two candidates. This lead was buoyed over the weekend by another round of strong polls for Obama: 5 point lead, 4 point lead, 8 point lead, 3 point lead, and 2 point lead. The prediction markets keep drifting more and more confident of an Obama victory in Ohio. 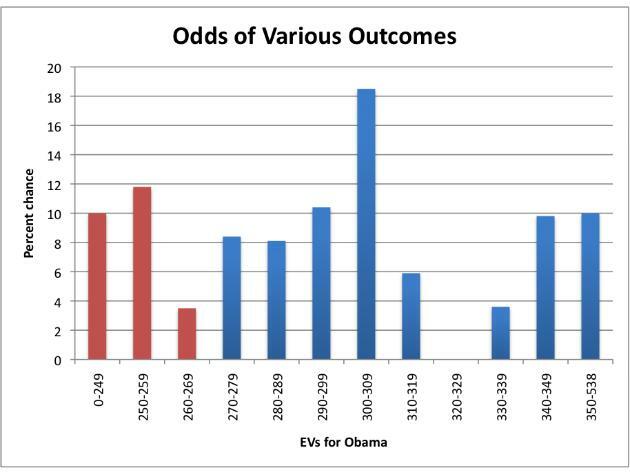 The math is pretty basic: Romney can only be as likely to win the country as he is to win Ohio. Romney is currently 19.9 percent likely to carry Ohio. Romney can still win this election, but Obama is heavily favored as we head into the final stretch. Follow the state-by-state and overall presidential predictions in real time with PredictWise.com.